Bed bugs are a non-discriminating pest. They live in residences of all kinds – large and small, expensive and cheap – and can cause real problems if not dealt with in a proactive way. Luckily, however, there are extremely effective ways to control bed bugs. You do not need to expose your family and pets to harmful chemicals in order to deal with or prevent a bedbug infestation. One of the best-known and simplest methods involves the use of a mattress encasement that provides an all-in-one bedding solution to annoying bed bug situations. Prevention: Keep bed bugs out! Instead of waiting for an infestation to happen in your bed, you can cover any clean mattress with a mattress encasement and use it to proactively check for signs of possible bed bug migration. The mattress encasement will prevent bugs from being able to hide out in the nooks and crannies of your mattress and box spring. It also provides a smooth outer surface that will make bedbugs easily viewable; all you'll need to do is perform a regular visual inspection every time you change the sheets. 2. Reaction: Keep bedbugs in! If you wake up one morning and realize that you have been visited by bed bugs overnight, you can encase an infested mattress to prevent the pests from spreading. An effective encasement will not let them through to feed on your blood or to migrate elsewhere to feed on anyone else’s blood. Eventually, the bedbugs will die (this could take up to 18 months) and you will not have to throw out your mattress and buy a replacement. In the meantime, the encasement will keep you protected from their incessant biting and invasion of your comfort. If the encasement material is not scientifically proven to prevent bed bugs from feeding through it or escaping from its confines, then the encasement could actually promote the survival of these insect pests. 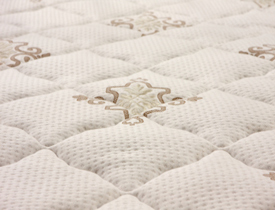 An area to pay specific attention to on your mattress encasement is the zipper. Effective zippers will close all the way at the end stop and will have small enough teeth that bed bugs won’t be able to squirm their way through. If the zipper doesn’t stay closed and falls back even a tooth or two, an opening may be created large enough to allow bed bugs in and out of the encasement. One brand name you can trust is BugLock®, manufactured by Protect-A-Bed. They make encasements which are scientifically proven to be effective against bed bugs. Ask your local exterminating expert for other brands that also do the job. And remember, once you install your mattress encasement, you should view it as the new exterior surface of your bed. Don’t try to rearrange or wash it. Instead, cover it with fitted sheets that can be washed and replaced as needed. If you notice that your mattress encasement is ripped or worn through, you should purchase a new one immediately to ensure a bug-free atmosphere. Find a qualified local exterminator if you've got bed bugs.